Half Price for EU citizens aged 18-24 and EU permanent school teachers. Reductions and free tickets can be issued only by showing a valid document (passport, identity card, driving license). Your Guide will meet You at the pre-arranged time You decide to start this tour. 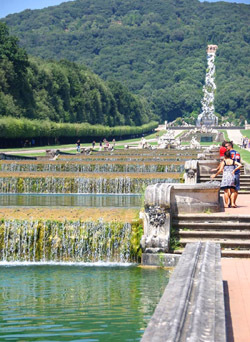 The Royal Palace of Caserta (Reggia di Caserta) is a former royal residence in Caserta, southern Italy, constructed for the Bourbon kings of Naples. It was the largest palace and one of the largest buildings erected in Europe during the eighteenth century. In 1997, the Palace was designated a UNESCO World Heritage Site, described in its nomination as "the swan song of the spectacular art of the Baroque, from which it adopted all the features needed to create the illusions of multidirectional space". The construction of the palace was begun in 1752 for Charles VII of Naples, who worked closely with his architect Luigi Vanvitelli. When Charles saw Vanvitelli's grandly-scaled model for Caserta it filled him with emotion "fit to tear his heart from his breast". 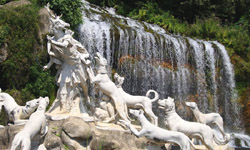 In the end, he never slept a night at the Reggia, as he abdicated in 1759 to become King of Spain, and the project was carried to completion for his third son and successor, Ferdinand IV of Naples. 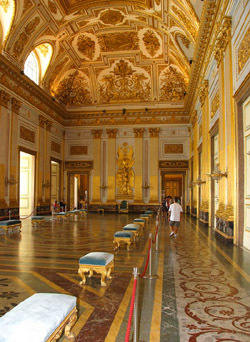 The palace has some 1,200 rooms, including two dozen state apartments, a large library, and a theatre modelled after the Teatro San Carlo of Naples. 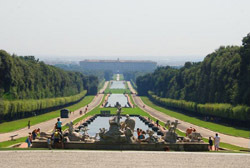 THIS EXCURSION AT ROYAL PALACE OF CASERTA COSTS EURO 150. ENTRANCE FEE IS NOT INCLUDED.